Fly down to the Smokies and take your vacation to new heights when you stay in this charming 2 bedroom 2 bath real log cabin! Located in the famous Douglas Lake Resort - EAGLE'S BLUFF is accessed without any steep mountain roads and offers guests the closest Douglas Lake access in the Smokies! Just 15 miles to Dollywood without getting on the busy main parkway - EAGLE'S BLUFF offers guests the best of both worlds - lake access and a convenient drive back to all the attractions. Bring along your fishing boat, or rent one locally to take advantage of the community boat ramp, dock, and outdoor swimming pool! Whether your relaxing in the cabin's steamy hot tub, or swimming in the pool or lake - you'll want to be sure and bring your swimsuit along! 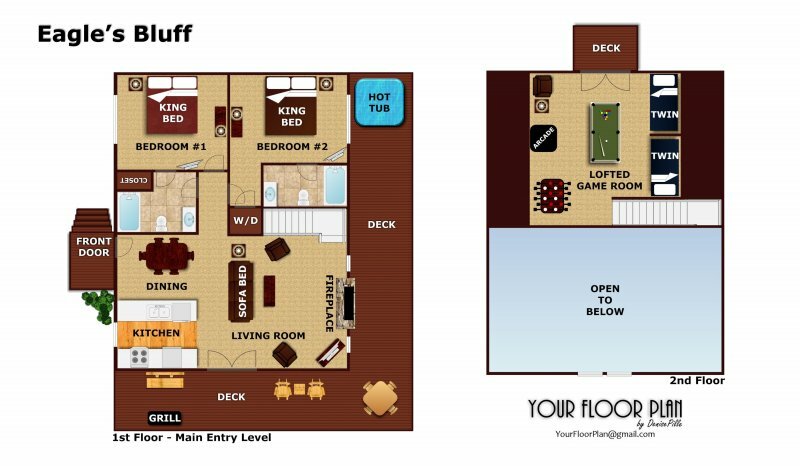 Inside, two main level bedrooms each have their bathroom, and a lofted game room includes pool table and foosball game! Your group will have fun "nesting" at EAGLE'S BLUFF. Call today!